The vibrant colored bounce house rental will be sure to brighten up your party and be the focal point of the yard. The multi colored bounce house is good for both boys and girls and will go with any type of themed party you are having. Kids of all ages will love bouncing in the bounce house. Kids are most excited when they see our delivery drivers arrive with your bounce house and start setting it up and inflating it. When your guests arrive to the party the kids head right into the bounce house rental. Even the shyest of kids cant resist going into the bounce house and bouncing with others. 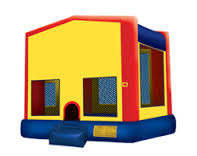 Day and Night Bounce House Rentals Cape Coral has the lowest price bounce houses in the area. Give us a call today to reserve yours. Be Sure to View all of our bounce house rentals by clcking bounce house rentals here.